Adam Johnston, Author at Solar Love! Global solar installations will rise by to 2020 to 92 GW yearly, according to a new report from Apricum, compared to 42 GW annually in 2014. The Berlin-based cleantech consulting firm said most of the 50 GW in annual increases from 2014 until 2020 will come from China, the US, and India, with 36 GW combined. The Middle East/North Africa/Africa (MENA) region will represent 6 GW, the rest of Asia 5.6 GW, the non-US Americas 4.1 GW, and Europe 3.5 GW. However, Japan expects to see declines yearly (-5.2 GW) as it looks to slow its hot growth. Apricum also notes cumulative installations will reach 604 GW, from 178 GW six years earlier. In regards to cumulative installations, China will lead with 180 GW, followed by the US (83 GW), Japan (57 GW), Germany (46 GW), and India (41 GW). Concerns over air pollution and climate change will help China with its steady growth. Meanwhile, the US will see continued growth as more regions hit socket parity and grid parity. Apricum predicts a good 2015, followed by a drop in utility-scale installations as the federal tax credit drops from 30% to 10%, due in 2017. However, strong rooftop demand, thanks to declining solar prices will continue to bolster US markets, Apricum suggests. Recent clean power legislation and Hillary Clinton’s plan of reaching 140 GW by 2020 may also have positive effects. SolarCity is taking aim at the small and medium business (SMB) installation market. The #1 US residential installer will allow SMBs to pay less for solar compared to utilities under a new offering. SolarCity will allow for flat & fixed payments over 20 years for the solar electricity. This allows SMB customers to save if future utility rates go up. Meanwhile, California SMBs will pay 5–25% less for solar electricity than they normally would through a utility, according to SolarCity. The California-based solar company plans to create SMB solar plant systems between 30 kW and 500 kW in size for buildings that have 5,000–50,000 square feet of flat roof space. The SMB market is potentially a huge market for solar installers. Considering 99% of US businesses are small businesses, which also create most new net private sector jobs (64%), it’s a no-brainer that SolarCity is tapping into this area. The trouble, Rive said, is that it generally has cost too much to develop and install a solar array on the roofs of small businesses. The solar companies had to spend time customizing the system, which created design costs and legal fees. And with installation of the panels farmed out to subcontractors, the deal never made economic sense. Sunrun recently put out an advertising campaign promoting its business while debunking stereotypes related to solar energy. While wearing hemp shirts and having tattoos of peace signs is nice for some, most people are going solar because of one thing: Money. And this includes a large cross-section of society. Sunrun is helping to save customers as much as 20% on their electricity costs, the company notes. Other solar companies are as well. Sunrun: Dolphin babies from mark lawson on Vimeo. As solar prices continue to fall, more consumers will look into solar as an alternative electricity source. Companies like Sunrun, SolarCity, and Vivint Solar are now providing choice in the electricity market, compared to a generation ago. Utilities are trying to adjust to this disruptive force in the energy market and are now struggling to maintain revenue. So, check out the commercials above and enjoy. Whoever would have thought that going green would save customers money? Now that’s a radical idea whose time has come! Yingli Solar recently had tryouts in China for the upcoming FC Bayern Munich Youth Cup later this year. Yingli, one of the world’s premier solar manufacturers, along with Central China Television (CCTV 5), aired the last match of the “Who is the King” qualifying tournament in Beijing’s National Gym. Hundreds of Chinese Youth have the chance to play for China’s FC Bayern Munich Youth Cup squad for this year’s cup finals, being held in Munich, Germany. Besides China, other countries participating include; Austria, India, United States and Thailand, and Germany. All players involved will see a live FC Bayern Munich game, when they take on Mainz at the Allianz Arena. FC Bayern Munich is one of the premier soccer clubs in the world — not only in the Bundesliga, but also in Europe. Currently leading the Bundesliga by a huge margin, it will begin Round of 16 play in the UEFA Champions League knockout stage against Ukrainian champions Shakhtar Donetsk this week. Bayern has won in its history 24 German titles, 17 cups, and 5 European club championships. Yingli Solar Vice President of Global Marketing Judy Tzeng Lee said Yingli is proud to support FC Bayern Munich in promoting soccer in China while raising awareness of solar energy among the broader public. “China is one of the most important growth markets for FC Bayern, and we’re pleased to have a sponsor like Yingli to help us become more established in the region. By partnering with Yingli to give China’s most promising youth footballers the opportunity to compete at the Allianz Arena, we are helping to develop a strong football culture in China,” said Paul Breitner, FC Bayern Munich’s Brand Ambassador. Solar in sports is becoming more popular, and increasing acceptance in the public domain. Bayern Munich last summer installed a rooftop solar panel at its training facility. Yingli last year was a sponsor of the 2014 FIFA World Cup and was key in providing solar panels for many facilities. Meanwhile, the US Solar Energy Industries Association (SEIA) recently released a report detailing the dramatic increase in solar installations within United States pro sports facilities. Using sports is a great marketing tool for solar companies in branding their product to more consumers. After all, this year’s Super Bowl between the New England Patriots and the Seattle Seahawks was the most-watched television program in US history. The UEFA Champions League final often surpasses the Super Bowl in global viewership. In the future, don’t be surprised to see solar companies splurge on advertising on more big-ticket sporting events in a bid to attract more customers. They certainly should. Solar in sports is becoming mainstream — as professional sports seek a competitive edge in sustainability. 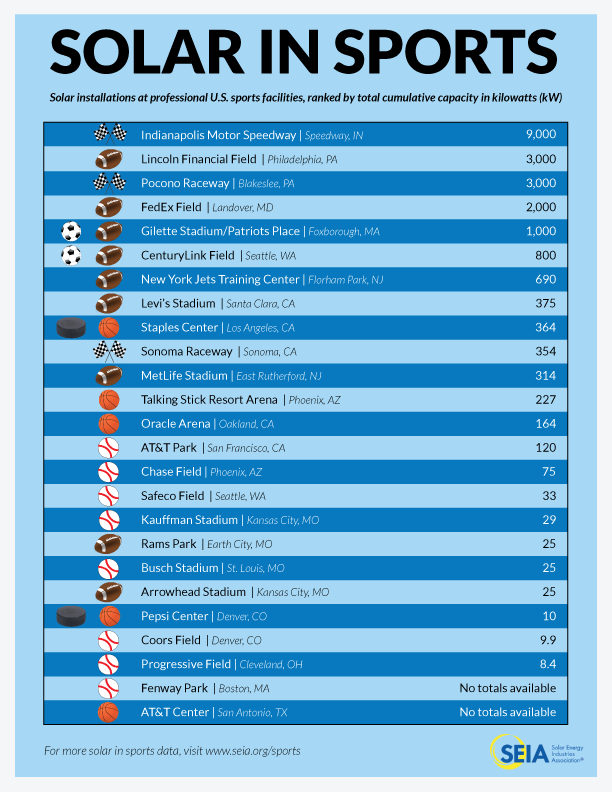 According to a new study from the Solar Energy Industries Association (SEIA), total accumulative solar capacity in pro sports facilities hit 21.7 MW in 2014. That’s enough to power 3,000 US homes. SEIA’s study looked at 25 stadiums and arenas as well as 12 raceways. Topping the solar list was Indianapolis Speedway, home of the Indianapolis 500, with 9,000 kW of solar power capacity. Indianapolis Speedway has the largest sports solar farm in the world, enough to power 1,000 US homes. Second is a tie between Lincoln Financial Field (home of the National Football League’s Philadelphia Eagles) and Pocono Raceway, with 3,000 kW each. Fourth was the NFL’s Washington Redskins FedEx Field in Landover, Maryland, with 2,000 kW of solar. Rounding out the top five is home for the NFL’s New England Patriots and Major League Soccer’s New England Revolution, Gillette Stadium in Foxborough, Massachusetts (1,000 kW). Staples Center in Los Angeles, California, home of the National Hockey League’s Los Angeles Kings plus the National Basketball Association’s Los Angeles Lakers and Clippers, topped solar energy capacity for an NHL/NBA arena with 364 kW. San Francisco Giants AT&T Park, with 120 kW, was Major League Baseball’s number one solar representative. Overall, SEIA’s study into solar in professional sports facilities provides a fascinating correlation with what is going on in the rapid growth in overall solar markets. Consider that, in 2007, the Colorado Rockies Coors Field was the first pro sports facility to install a solar power system (at just 9.9 kW). In just over 8 years, pro sports solar installations have grown 10 times over, with 123,000 panels installed across 37 US facilities. During this period, US solar installations have also rapidly grown. New solar PV installation capacity back in 2007 was 0.342 GW. In 2014, third quarter installations were 1.35 GW alone. Falling solar costs, along with increased risks from climate change, have been key drivers in helping professional sports facilities move towards solar energy. With more extreme weather events anticipated due to a changing climate, expect further renewable energy investments from pro sports leagues, especially as sports look to power the games we love to watch without wrecking the planet. Elon Musk believes solar and utilities can exist together, despite uneasy feelings among many within the utility sector. Speaking at the Detroit Auto Show, Musk said that expanding electric vehicle markets, along with businesses and homes as solar power generators, will change how we view electricity demand. “As we transition to electric transport, we’re going to see a significant increase in the demand for electricity,” SolarCity’s chair and Tesla’s CEO said, hinting that utilities will have a good future. Musk told the Detroit press conference that he sees future electricity demand doubling. Half of supply would come from solar while half would come from the current utility, while the demand from current utilities would remain more or less unchanged. In 2015, the US Energy Information Administration predicts large-scale generators will create less electricity than in 2007, even with steady economic improvement. Along with declining solar costs, it’s understandable why consumers may want to go off grid. With solar’s rise, many US utilities have raised concerns of possible declining market share and increased grid maintenance costs. Interest groups have worked hard to disrupt solar’s momentum, including lobbying for solar tariffs. Utilities argue this helps keep up the current grid, and not pass costs on to normal, customers. Solar advocates would argue these “taxes” discourage consumer from going solar, and fail to note or value several benefits to the grid and society that come from distributed solar power. Unfortunately, some states have taken regressive action. Oklahoma signed a bill last spring allowing state utilities to charge higher rates for solar rooftop owners, compared to normal customers. Disruptive technologies, like solar power, are now making utilities think how their business model can work in the 21st century. This same situation occurred when the Internet disrupted other sectors (including music and print media). Utilities now face some unique challenges, including climate change, but they can take advantage of solutions like electric vehicles in order to survive. Lyndon Rive, the CEO of SolarCity, told The Financial Times that it’s critical to have a grid, and that people misperceive what they are attempting to do at SolarCity. “When you’ve had a monopoly for a hundred years, and you’ve never seen change, change may seem like death to you,” Rive said, suggesting utilities are seeing a “change spiral” now within this sector. Utilities will have to change, to meet the growing demand for sustainable energy alternatives from customers. At the same time, Musk’s (and Rive’s) view is that utilities and solar companies co-existing is not out of line. The question is, are utilities now willing to meet the rapidly changing energy landscape? Morgan Stanley’s recent $250 million investment has bumped US home solar investments towards nearly $800 million in 2015 already. MS Solar Investments, Morgan Stanley’s solar subsidiary, will aid Brite Energy (a subsidiary of Protection 1) and Main Street Power with their work. Morgan Stanley’s funding will allow for further expansion of Brite Energy into more states. Brite Energy Chief Structure Financial Officer Jimmy Chuang said that he anticipates further growth this year while doubling Brite Energy’s financing. “Leveraging the customer-centric capabilities of Protection 1, we have created the ultimate customer acquisition experience for our Brite customers,” said Chief Revenue Officer Jared Chappel of Bright Energy. “We look forward to accelerating our customer acquisition in 2015 through our innovative, solar energy made easy platform,” he said. 2015 has already been a gangbusters year for residential solar financing, and January is not even done yet. SolarCity and JP Morgan last week agreed to a $350 million partnership. Meanwhile, Investec will support SunRun with $195 million in financing new projects. Morgan Stanley has been putting big money into cleantech as of late. In 2013 alone, it invested $9.5 billion in capital, and it has invested over $55 billion since 2006. Large financial institutions have shown their willingness to invest in solar as fossil fuels become a riskier investment. This is thanks to scientific analysis suggesting that burning fuels from places like the tar sands of Canada will cause rampant global warming. With dropping solar costs, investors will continue moving away from dirtier investments as the public demands more from Wall Street in helping to prevent catastrophic climate change. Expect more big residential solar financing announcements like Morgan Stanley’s as 2015 rolls on.